The chair of the inquiry, Shami Chakrabarti, formally invites members and supporters of the Labour Party and members of relevant communities to submit evidence to this inquiry. To submit evidence please email inquiry@labour.org.uk, use the form below, or write to: The Chakrabarti Inquiry, c/o The Labour Party, Labour Central, Kings Manor, Newcastle upon Tyne, NE1 6PA. The deadline for submissions is 10th June 2016 and the inquiry will report back by the end of June 2016. Q: What is or has been your connection with or interest in the Labour Party? A: I have been a member of the Labour party, with a few breaks, for approximately 30 years. I was auto-excluded in August 2015, readmitted on appeal on 30 November 2015 and expelled again on 9 March 2016 immediately following a question to Jeremy Corbyn by David Cameron during Prime Minister’s Question Time. No hearing was held and the expulsion stipulated that no right of appeal was allowed. I have been a member of Unite and its predecessor, the TGWU since 1991 when I became a bus driver. Previously I was a member of UCATT when I worked in the building trade. Q: Please describe any form of antisemitism, Islamophobia or other racism that you have experienced or observed within the Party? A: I have never encountered any antisemitism in the Labour party. Some racism against blacks and immigrants but when challenged these remarks were almost invariably withdrawn. Islamophobia ids much more prevalent due to mass media and Tory political campaigning which makes it almost respectable. Undoubtedly it is the racism de jure in Western society. Q: What is your understanding of the Party’s ethics, rules and procedures for dealing with any form of inappropriate language or conduct? A: I think the Compliance Unit is a total anomaly and should be abolished immediately. Its practice of auto-exclusion, which now anecdotal evidence indicates runs into hundreds, is in total contradiction to the spirit of Article 6 of the European Convention of Human Rights, which my submission below elaborated on. Q: Have you any positive suggestions for the future, including training, codes of conduct, rules and discipline for members, candidates and representatives of the party? A: I believe all complaints should be dealt with in a democratic and open manner by elected officials of the Labour party, a subcommittee of the National executive Committee or similar. All complaints should be properly investigated, the accused should be given the right of representation and should be able to face their accuser. The presumption of innocence should be upheld and not the presumption of guilt on presentation of a charge, often by bodies outside and hostile to the Labour party and its current leadership in particular, as is now the case. In short the standards of justice elaborated in the European Convention of Human Rights, Article 6, should be applied and not those practiced by third world dictators or, worst, by 20th century examples of advanced capitalist dictatorships. Before any investigation commences I think a clear and unambiguous legal definition that will be used throughout these proceeding of what exactly constitutes “antisemitism”? 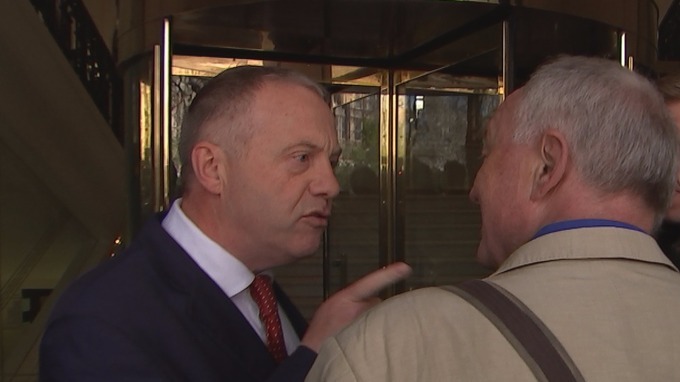 Thuggish bigot John Mann MP wants to have it both ways on antisemitism: Israel represents all Jews; world Jewery, but criticising Israeli collective punishment of Palestinians by bombing the civilians in Gaza as the actions of ‘the Jews’ is antisemitism, because Israel does NOT represent all Jews. This is the also the absolute contradictory line taken by the official spokespersons for and political leaders of the state of Israel. We need absolute clarification on this. So what is anti-Semitism and what is anti-Zionism? The source of the current witch hunt against the Labour left is the far right blogger Guido Fawkes (aka Paul Staines) and Zionist organisations like the Jewish Chronicle and the pro-Zionist Labour Friends of Israel and then it is pursued by David Cameron and right wing Blairite MPs like John Mann and Wes Streeting and media Zionists like Nick Cohen and Jonathan Freeland. For them it is essentially criticism of the actions the state of Israel takes against the Palestinians. I was expelled again on 9 March two hours following a question by David Cameron to Jeremy Corbyn during Prime Minister’s Question time, prompted by an article by the right wing Tory blogger Guido Fawkes. There was no hearing and the expulsion letter excluded any right of appeal under the very undemocratic structures under which the Labour party Compliance Unit operate. Every national trade union provides a disciplinary procedure that is broadly in line with these universal principles. Every instinct of natural justices tells us that these are minimal standards when any national or local body or association seeks to discipline one of its members. That the Labour party’s Compliance Unit should have the power to ride roughshod over these principles in the way it does is a total anomaly. I was expelled from the Labour party within two hours of David Cameron asking a question about me in the House of Commons on 9 of March on charges that had been rejected by the Labour Party itself on my appeal on 30 November 2015. It is obvious that it is the allegations made about me by Cameron prompted by Staines there that motivated my expulsion. Guido Fawkes, aka Paul Staines, subsequently boasted of his success on his blog. I have never done or said an antisemitic thing in all my 40 years of leftist political activity. Of all the supposed cases of anti-semitism only one has any real substance to it in that it targets Jews as such and not the state of Israel. Of course since Israel insists it is the representative of world Jewry it does logically follow that we should accept that the murderous repression of the Palestinians is done in the name of world Jewry and blame them all for it. But no leftists accepts that Zionist lying propaganda. If we did we would be anti-semitic. All who accept Israeli propaganda on this are charged by Israel defenders as antisemites, in complete contradiction to their own hypocritical stance. But when Turkish Muslim woman, Aysegul Gurbuz a 20 year old Luton Labour Councillor, did just that it is clear that her remarks were absolutely anti-semitic. She referred to “my man Hitler” and said he was the “greatest man in history”. But even here it is clear that her anti-semitism is fuelled by a hatred for what Israel does to the Palestinians. What do we make of the suspension of Bradford Councillor Khadim Hussainquit? He apparently shared a Facebook post stating that history books “only tells you about Anne Frank and the six million Zionists that were killed by Hitler”. He too believed the Zionist propaganda (the majority of the Jewish victims were supporters of the left wing Bund and not the right wing Zionists). We cannot now raise the case of the other 6 million, the Roma, homosexuals, disabled, communists and Red Army soldiers, all equally untermensch, who also perished in that holocaust or we can be charged with anti-semitism also. Really? The fascists that infest the Ukraine government, the only state in the world that honours its Nazi collaborator, Stepan Bandera, who fly their Nazi-era emblems proudly today, who do not deny the Holocaust but celebrate it and want to do it again, are better in the considered opinion of Akhurst than left wing supporters of the Palestinians whose sympathy for them sometimes leads them to go over the top in condemning their oppressors. The Azov Brigade, the Svoboda Union and the Right Sector vie for primacy in their absolutely disgusting fascistic antisemitism. 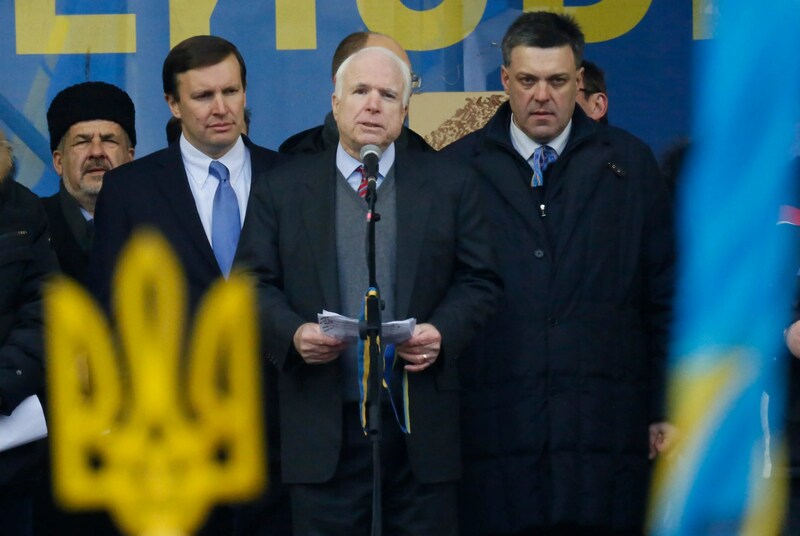 Stepan Bandera, national hero of Ukraine and Oleh Tyahnybok (right) with John McCain in 2014. Bandera was a Nazo collaborating fascist and Tyahnybok is a US collaborating fascist. And Jonathan Arkush thinks these are more acceptable than Labour party members! And then there is Ken Livingstone. Following the hounding of Naz Shah MP for anti-Israel remarks Livingstone stepped in to defend her. In the course of his defence he said: “Let’s remember, when Hitler won his election in 1932, his policy then was that Jews should be moved to Israel — he was supporting Zionism … This was before he went mad and ended up killing six million Jews”. He also said that Hitler’s policy initially was to deport Germany’s Jews to Israel only. Zionist leaders “had secret meetings with his administration talking about that”. These remarks are essentially historically correct, apart from minor and inconsequential mistakes. Israeli historian Tom Segev described it in his book, The Seventh Million: “The haavara (“transfer”) agreement — the Hebrew term was used in the Nazi documents as well — was based on the complementary interests of the German government and the Zionist movement: the Nazis wanted the Jews out of Germany; the Zionists wanted them to come to Palestine.” That agreement remained in force until 1942, the middle of World War II. But now the net widened. Jackie Walker, a vice chair of Momentum and a mixed Jewish/Black race person, was suspended at the behest of the Zionist bigots that run Israel Advocacy Movement and the Jewish Chronicle. Livingstone was convicted of telling the truth and now she faced the same fate. Though now reinstated her victimisation is another example of the unfettered and totally anomalous powers of the Compliance Unit, which should be immediately abolished, as John McDonnell has called for. A wealthy section of the Jewish bourgeoisie in the Netherlands with control of bank capital (“moneylenders”) provided much of the finance for the slave trade in that country, was the essence of her claim. That is a historical fact. Walker’s ancestors were both Black African and Dutch Jews who were originally expelled from Spain in 1492. And the involvement of the Dutch Jewish moneylenders in that slave trade is beyond challenge. 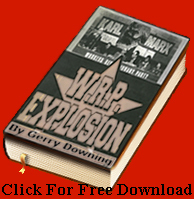 As is the emergence from that milieu of Baruch Spinoza, one of the greatest philosophers of the Enlightenment, whose pioneering monist philosophical work (‘thought and its extension are one substance’) prepared the ground for the modern ideology of Marxism, as Fredrick Engels famously acknowledged. And read Abram Leon’s book The Jewish Question, A Marxist Interpretation to understand why and how this occurred historically. But understanding this or even voicing the historical facts is now a crime in the Labour Party that gets you stigmatised as antisemitic. Obviously Abram Leon continued to apply this Marxist materialist philosophical method to the situation of the Jews in 1942 when he wrote the book, just two years before he was murdered by the Nazis in Auschwitz death camp. And Socialist Fight continues to apply that same method to the situation of Jews today, those who live in Israel, its ruling classes and government and those in the diaspora. There are no such political monster as Oleh Tyahnybok in the British Labour party. Left-wing anti-semitism is a contradiction in terms, it is a bogus category; it does not exist!